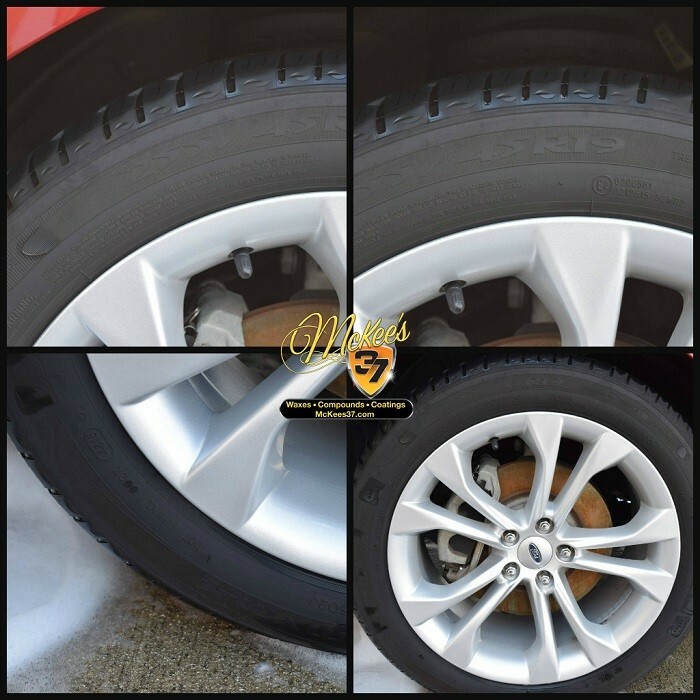 Cleaning well maintained tires is a easy and painless process, Trying to remove embedded browning from tires is a completely different ball game. If you use the same technique as cleaning your well maintained tires, Once the tire becomes dry you will see that browning still sitting there mocking and laughing at you! With some patience and certain techniques you can and will restore the rubber to a OEM rubber finish. 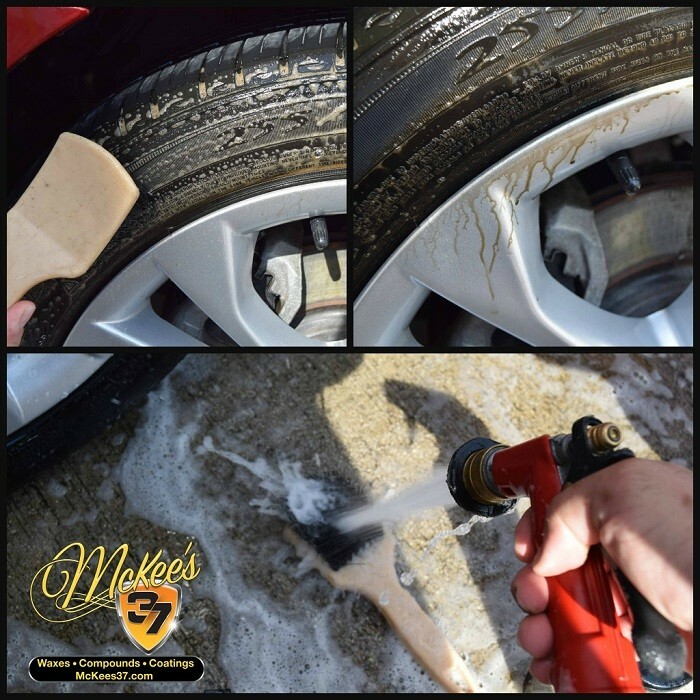 That McKee`s 37 Tire & Rubber Rejuvenator is a unique Tire "Cleaner"? The name says it all, I mean think about it! The name "rejuvenator" actually has significance. 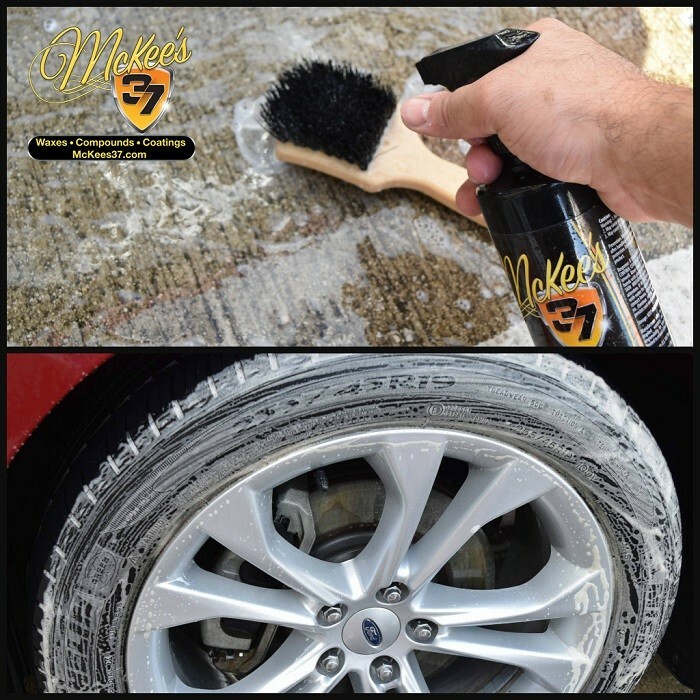 Tire & Rubber Rejuvenator does not just clean and remove the browning from your tires, But it helps hydrate the UV conditioners that your tire needs to stay flexible. It is actually so good for your tires you can actually wipe it off with a microfiber towel! 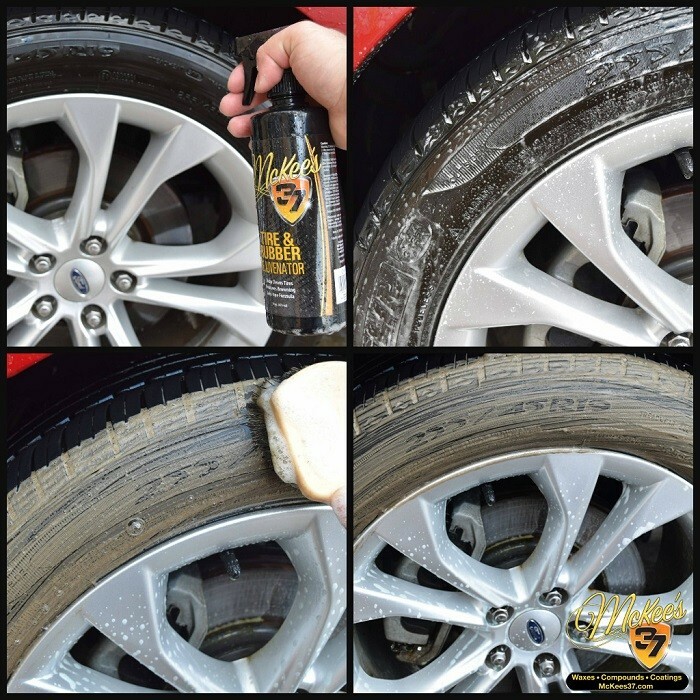 Correct it does not need to be rinsed off like other caustic Tire Cleaners. 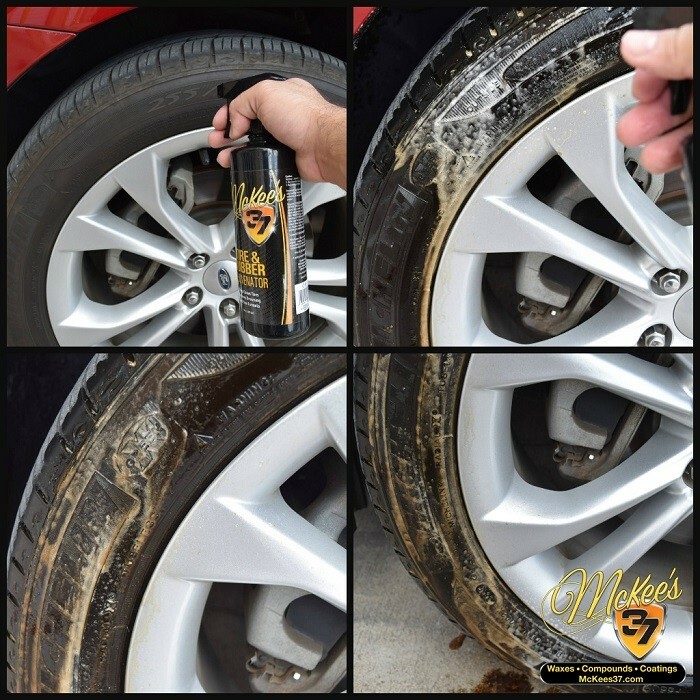 This makes the perfect and ideal Tire Cleaner for you rinseless washers out there! What makes Tire & Rubber Rejuvenator different from other tire cleaners? Well like with any other McKee`s 37 product Good chemistry is involved. 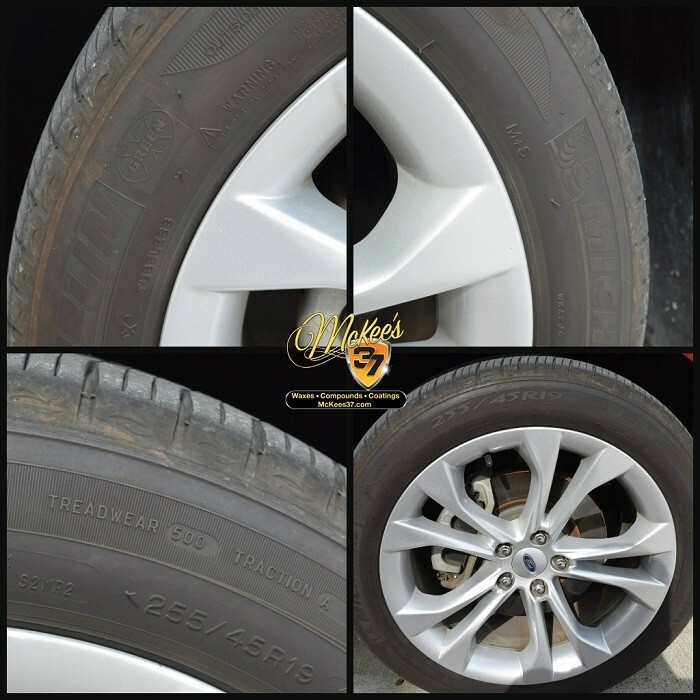 The majority of Tire Cleaners on the market are bad for your tires, They contain high-octane caustic chemicals that cause more harm than good. There are some Tire Cleaners on the market that are offered at amazing price points, This is because they utilize these high-octane caustic chemicals, good chemistry is not involved. Some cleaners are so nasty that with the first couple of sprays you cant help but choke for a few mins, These are the cheap caustic chemicals I am talking about. After speaking with Nick about what makes this product unique he explained to me that he went though dozens of formulas to get Tire & Rubber Rejuvenator right, The first formulations he said were too strong and was not good for rubber tires, He wanted a perfect balance of cleansing power and safety for a tire cleaner. Now that we understand Tire & Rubber Rejuvenator let`s get into this how-to guide. Let`s see what we are up against. These Tires were bad, They could not leave the Trademark Garage with brown still remaining on the tires! Step 1: DO NOT RINSE OFF YOUR TIRES FIRST! This is very common mistake, and with my experience this step is actually hurting the effectiveness of the product. Now it is time for the real steps! Step 1: Saturate Tire & Rubber Rejuvenator to a DRY Tire. You will instantly see the cleaner go to work breaking down the stubborn browning of the tires. This is the most vital step in this entire process to remove 100% of the browning. These tires are going to take MULTIPLE passes to remove this stubborn browning that has been embedded for god only knows how long, We want to remove the MAJORITY of the browning before we start agitating with a brush. The cleaner has broken down the majority of the dirt, It is now TIME TO RINSE OFF THE BULK of the dirt. This rinse is going to remove a good portion of the dirt, The only dirt that is going to remain is the stubborn embedded browning. Step 2: Rinse OFF First Application Without Agitation Yet. Do you see all the browning that was removed with no agitation? This is why you do not Rinse off first, You let the cleaner remove the bulk of the dirt and rinse off. 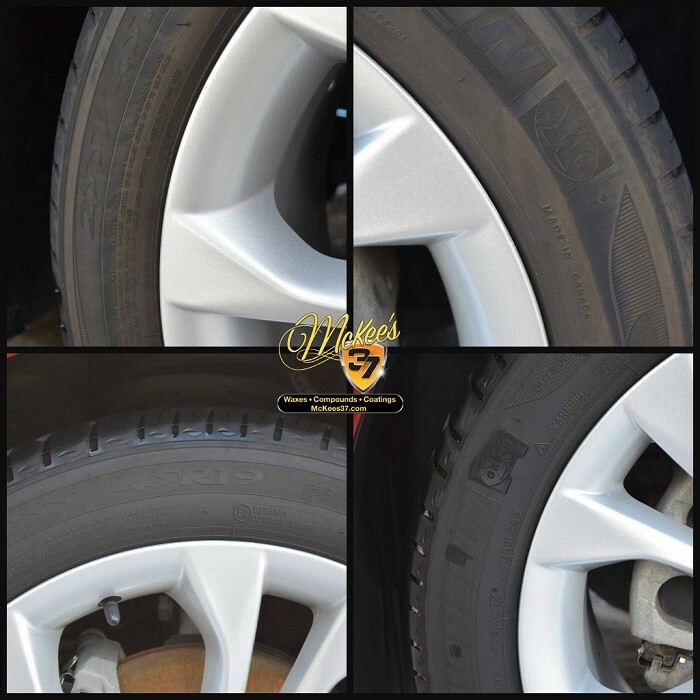 If you agitate you are essentially just grinding that browning and dirt back into the tire, AND THAT IS WHAT WE ARE TRYING TO REMOVE! 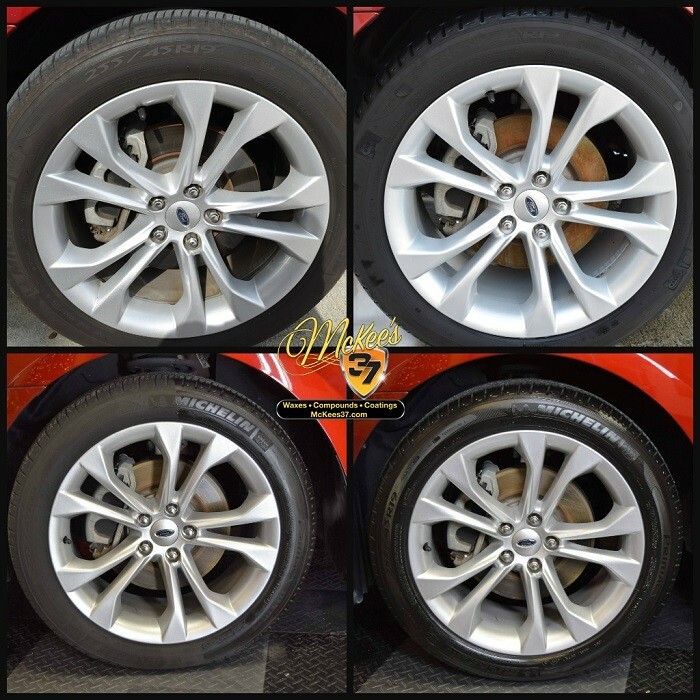 The idea is to remove the browning not rub it back in, After this you are working with the cleanest tire as possible. Step 3: Saturate Tire With More Cleaner and Agitate with Tire Brush. Do you see all the brown on the tires? The idea is to keep doing this untill we see no more brown, That is a indication that all the browning has been removed. 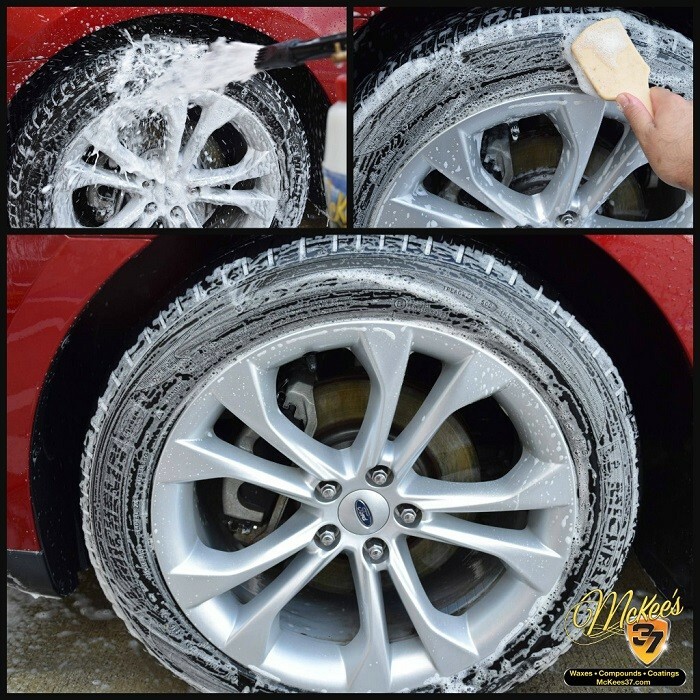 Step 4: Rinse Tire Brush Before 2nd Application. 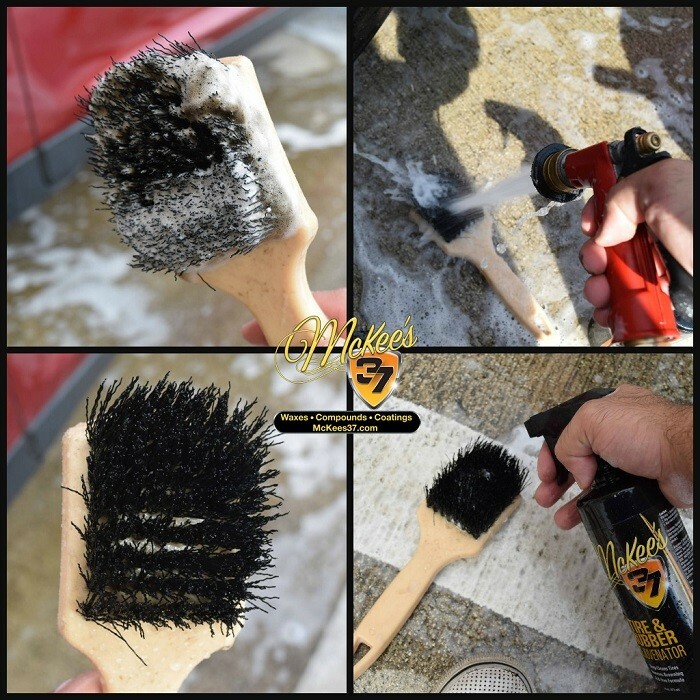 Keeping clean is very important during this process, You do not want to grind any dirt you removed back into the tire, Flush out your brush inbetween applications. You will notice in the bottom pic to the right I am spraying the cleaner directly onto my brush for some extra concentrated cleansing power. Step 5: After you Rinsed off your brush apply more product and keep agitating. Step 6: After this application you rinse off your brush again! Notice how the foam on the tire is much more white, We are almost there there is still some embedded browning that remains! I spray some more product on the brush and tire and go for the last pass! Notice How the foam looks pure white, No tint of brown any where in sight, This means we have successfully removed the browning. In the top left corner you will notice how I used a foam gun, This is optional! i Call this the "white glove test" This is to produce more white foam on the tire so I can test to see if any foam turns brown. 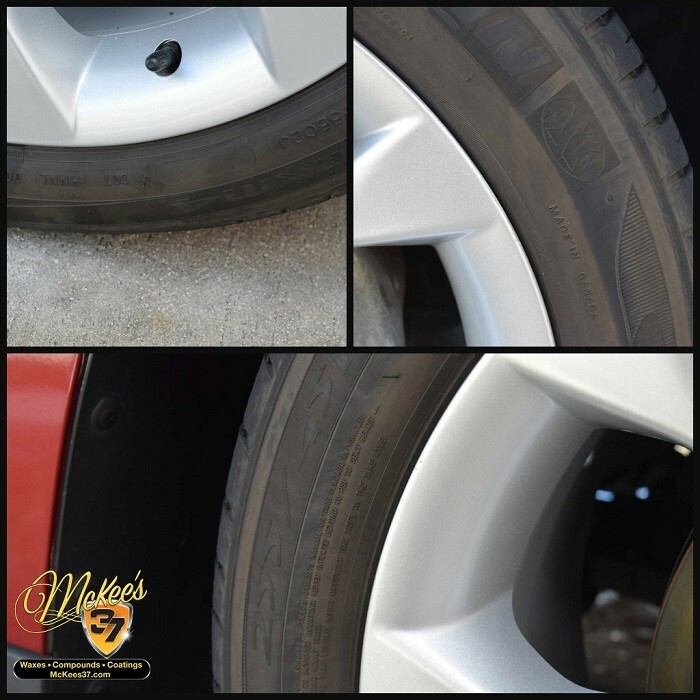 The Stubborn browning is removed and notice how the tire looks hydrated and dare I say "Rejuvenated"
A coat of McKee`s 37 Gloss Tire Gel was applied for a finished look.